Never played in by the team during the pre-season trials or the regular season. 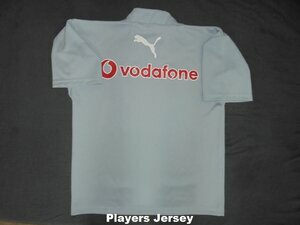 There was another grey version available that had a sleeve sponsor and black inner collar. If anyone can identify the sleeve sponsor than please me know. 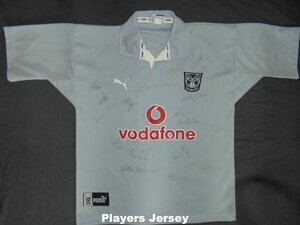 This jersey may even be from a different year as Im yet to find pictures of it but its constructed the same way as the 2003 range. I stand to be corrected. PLAYER JERSEYS - These were only team issued for training. Some were later signed and used as prizes and given to fans while the rest were given to players and staff when Puma stopped being the official supplier.